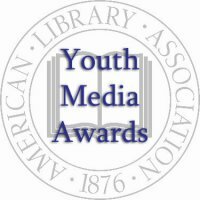 Like millions of other book lovers, I was glued to my computer watching the ALA Youth Media Awards Monday, January 10th. To my surprise, I recognized your name! Readers, Jeannette Larson was one of my professors in library school! In fact, I took her Youth Programs class during my last semester. She was fantastic! Welcome Jeanette, and thank you for walking us through the awards process! Have you served on an awards committee in the past? The first award committee I served on was Notable Recordings for Children. This is an ALA committee that selects the best audiobooks and music recordings for kids. It was a lot of fun and got me really involved in listening to audiobooks. I also served on two Newbery Award committees, the Texas Bluebonnet Award committee, Best Books for Young Adults, and several other awards committees. What are the beginning steps to being on an awards committee? Are you asked? Do you sign-up? It depends on the committee. Many ALA awards committees have both appointed and elected committees. A good first step is to sign up on the volunteer form BUT understand that the biggies like the Newbery will go to people who have served on other committees. The chairs and chair-elects who make appointments are always looking for "new blood" so start by saying you are interested in a "lesser" committee like the Carnegie Award (for film). To be elected, you need some name recognition that comes from being involved in the professional associations. Also look at state and regional awards as a place to get started. For example, the Texas Bluebonnet Award or the Lone Star Reading List may be easier to get on but provide valuable experience that prepares you for national awards. What drew you to the Excellence in Nonfiction for Young Adults Award committee? I love nonfiction but don't always make the time to read young adult nonfiction. The award is new. This was the second year for it to be given and the first year where committee members were elected by peers. I had previously served on the Morris Award Committee for YALSA (which honors a new YA author's work) and thought this committee would be fine. I also liked that the committee develops a shortlist of finalists. That is different from most other awards committees. At what point in the process does the committee get started? Again it depends on the award. For the Excellence in Nonfiction for Young Adults Award we started in January 2010 when we met to get acquainted. We read books that were published from November 2009 through October 2010. We each read individually and suggested books that we should all consider. How often did the committee meet? Our committee met in person three times--at the 2010 Midwinter Meeting, the 2010 Annual Conference, and the 2011 Midwinter Meeting. But we also used ALA Connect and email to communicate. Do you read every book nominated? ABSOLUTELY! I also read many good books that were not nominated. The committee reads all year. Since the books for the Excellence in Nonfiction for Young Adults Award can be published from November 2009 through October 2010, it's important to keep up with what is coming out so you don't fall behind. Was there a process of narrowing it down (top 12 etc...) or did you pick a winner? For this award we voted throughout the year on books that we really liked. That narrows the list down. In December we voted for the top 5--a short list--before the final vote at ALA Midwinter. What was some of the criteria for picking a winner? The criteria varies by award but for the Excellence in Nonfiction Award it includes that the book is designated as being for young adults by the publisher and that the book must include excellent writing, research, presentation and readability for young adults. When was a winner chosen, how long did you have to keep it a secret? The winner for this award was chosen on Saturday, January 8 at around 4:30 p.m. We had to keep it a secret until the press conference on Monday morning at 8:00 a.m.
Who were you most excited to meet at ALA this year? This was actually a brief ALA for me as I was only there for 2 days so I did not get to meet as many people as I would have liked. I was really excited to meet Tim Wynne-Jones and have dinner with him. I also had the first signing for my new book, Hummingbirds: Facts and Folklore from the Americas, so I was excited to meet birders and librarians who love bird books. You have a new book coming out this year, tell us about it. Oh, I jumped the gun! 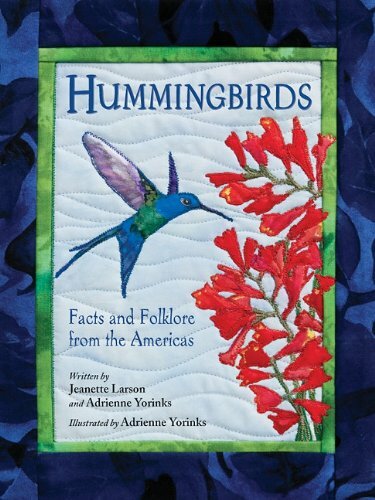 The book is a mix of facts and folklore about hummingbirds. These fascinating creatures only exist in the Americas and many first nation people have pourquoi stories. In addition to the typical facts about hummingbirds you would expect to find in a book--what they eat, where they migrate to, their anatomy, etc.--I retell stories that give more insight into them. The book is illustrated by Adrienne Yorinks in her trademark fabric art. The fabric art adds to the beauty of the book and makes it a good choice for birders of all ages. Adrienne and I have been friends for a long time and I worked with her on Quilt of States. We really wanted to do a book together so, contrary to all the conventional wisdom that states the author doesn't get to select the illustrator, we took the idea for hummingbirds to Charlesbridge together. For more information about the YALSA Award for Excellence in Nonfiction for Young Adults go HERE.